POOLE HARBOUR FLYING BOAT OPERATIONS 1939-1948 Back to Main List E-Mail me! Lat/Long:RAF HAMWORTHY(RAF POOLE) and BOAC Base(GDCB) - 50.42.25N/01.56.58W.Radio Call Sign(BOAC)"GJX". RNAS SANDBANKS - 50.41.20N/01.56.28W. Water aerodrome:longest take off/landing run QDM approx 100/280. 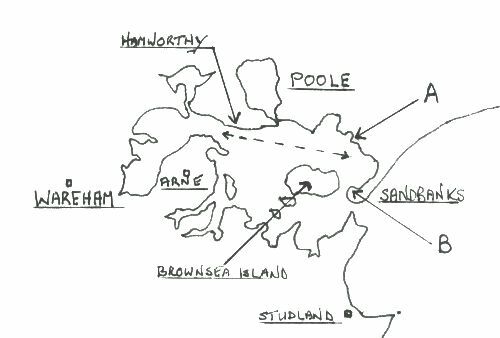 . . Map showing Poole Harbour. 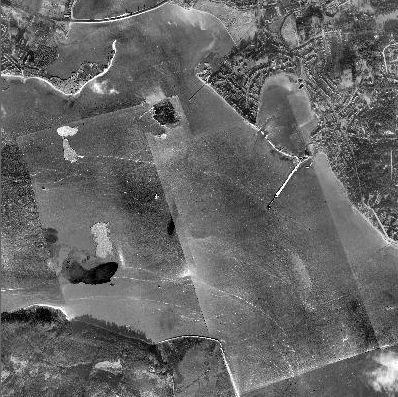 "A" = RAF Ops/BOAC base,"B" = RNAS Sandbanks.Dotted line shows approximate line of longest trot(take off/landing run). . Left: 1940 overhead shot of Poole harbour -RAF/BOAC base at mid right. Just left of centre is a Sunderland Flying boat . 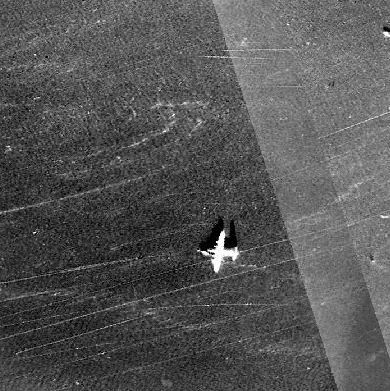 Right: enlarged image of the Sunderland. . . The story of flying boat/seaplane operations at Poole during WW2 involves 3 separate organizations,the RAF,the Fleet Air Arm and BOAC. . The first of these to arrive was BOAC which transferred it's flying boat operations from Southampton at the beginning of WW2.The company was based in space requisitioned from the "The Harbour Club & Hotel" at Salterns Pier,Lilliput ("A" on the map).From here services recommenced including those to the USA which restarted 4th August 1940.In addition the terminal handled the incoming Pan American "Clipper" S-42 aircraft. 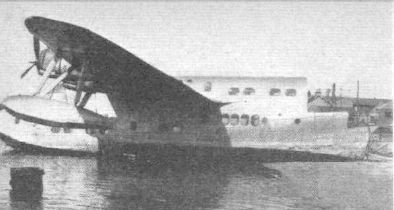 At the end of the war ,BOAC did not leave immediately for Southampton,staying on at Poole until April 1948.Services recommenced from Southampton on 14th April 1948.After this date the only remaining flying boat activity of any kind was the storage and eventual scrapping at Hamworthy of several surplus civilian aircraft in the 50s. The last flying boat to be scrapped here was Solent G-AHIL in June 1958(see picture below). If you want to learn more about Flying boats, visit the Poole Flying Boats Celebration website..
. RAF UNITS . 3461(RAAF Sq,Sunderland II/III,arr 31-8-42(some sources say 5-9-42),dep 20-4-43 210Sq,Catalina IIB,arr 21-4-43,disbanded 31-12-43 44 Group,Transport Command ,Sunderland,13-1-44,dep March 44 . FAA UNITS . 765 and 766 Seaplane School,Walrus,Swordfish,Seafox,Kingfisher,arr 15-5-40,dep 10-43.